In the integrally shaping process from a simple material shape to an objective shape, it is necessary to reduce the time required for the machining process in order to improve cost savings and the effectiveness of mass production. For the purpose of achieving high efficiency in the integral shaping from simplicity materials, we have focused on a rough cutting process that requires the most time in the manufacturing process. 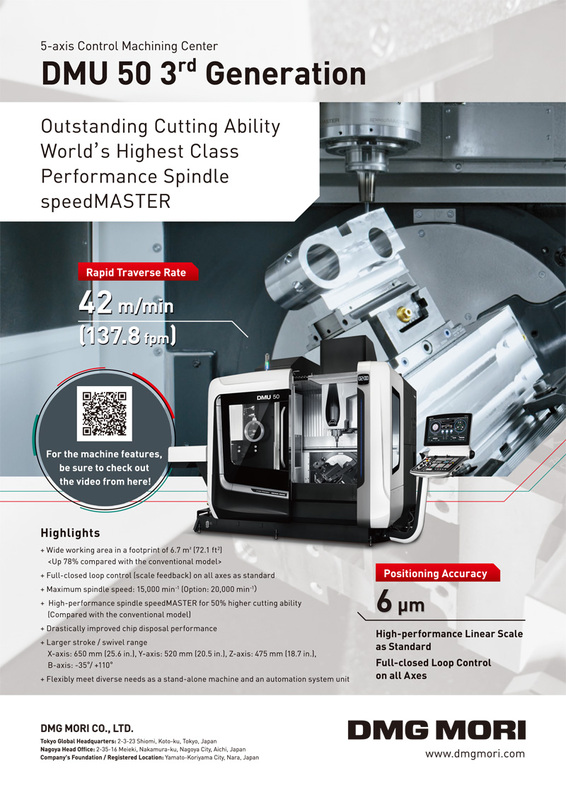 The purpose of this research is to propose a method for realizing high-speed rough machining using five-axis machine tools with a voxel model, and confirm the high efficiency of the rough cutting. In this research, we use five-axis controlled machine tools for material machining, and suggest two machining methods for the rough cutting process using the voxel model. The first method derives the tool posture where the cutting removal quantity becomes the maximum; this method also carries out a rough cutting process via 3+2 axis controlled machining. The other method carries a complete convex shape that includes the required shape, and simultaneously machines via five-axis machining based on the complete convex shape. This paper demonstrates the 3+2 axis control machining method that uses the voxel model to perform the rough machining process with high efficiency, and the simultaneous five-axis control machining method that uses a complete convex shape model for rough machining. We confirm the results with a computer simulation and actual machining experiments. M. Yamada, T. Kondo, and K. Wakasa, “High Efficiency Machining for Integral Shaping from Simplicity Materials Using Five-Axis Machine Tools,” Int. J. Automation Technol., Vol.10, No.5, pp. 804-812, 2016. H. Suzuki, Y. Kuwano, K. Goto, Y. Takeuchi, and M. Sato, “Development of the CAM System for 5-Axis Controlled Machine Tool,” J. of the Japan Society for Precision Engineering, Vol.60, No.6, pp. 832-836, 1994. T. Hikichi, K. Nakamoto, T. Ichida, and Y. Takeuchi, “Development of CAM System for 5-axis control Machining by Considering Tool Attitude and Attitude Variation,” J. of the Japan Society for Precision Engineering, Vol.77, No.8, pp. 766-770, 2011. M. Morikawa, T. Ishida, K. Teramoto, and Y. Takeuchi, “5-Axis Control Path Generation Using Curved Surface Interpolation,” Int. J. of Japan Society of Mechanical Engineers, Vol.49, No.4, pp. 1209-1214, 2006. X. W. Liu, “Five-axis NC cylindrical milling of sculptured surfaces,” Computer-Aided Design, Vol.27, No.12, pp. 887-894, 1995. M. Kaneko and K. Morishige, “Tool Path Generation for Five -Axis Controlled Machining with Consideration of Motion of Two Rotational Axes,” J. of the Japan Society for Precision Engineering, Vol.76, No.1, pp. 101-105, 2010. C.-C. Lo, “Efficient cutter-path planning for five-axis surface machining with a flat-end cutter,” Computer-Aided Design, Vol.31, No.9, pp. 557-566, 1999. J. P. Kruth and P. Klewais: “Optimization and Dynamic Adaptation of the Cutter Inclination during Five-Axis Milling of Sculptured Surfaces,” Annals of the CIRP, Vol.43, No.1, pp. 443-448, 1994. J. Kaneko, “Planning Method of Tool Posture in Continuous 5 Axis Control Machining Using 2D Rectangular Coordinates System corresponding to Rotation Angles of Rotary Tables in Machine Tool,” J. of the Japan Society for Precision Engineering, Vol.75, No.4, pp. 530-535, 2009. P. Gupta, R. Janardan, J. Majhi, and T. Woo, “Efficient geometric algorithms for workpiece orientation in 4- and 5-axis NC machining,” Computer-Aided Design, Vol.28, No.8, pp. 577-587, 1996. M. Yamada, F. Tanaka, T. Kondo, and T. Kishinami, “Tilted Tool Axis Machining on 5-Axis Machine Tools,” Int. J. of Automation Technology, Vol.1, No.2, pp. 120-127, Nov. 2007. M. Yamada, F. Tanaka, T. Kondo, T. Kishinami, and A. Kohmura, “Sculpture Surface Machining by Automatically Indexing Tilted Tool Axis on 5-axis Machine Tools (1st Report),” J. of the Japan Society for Precision Engineering, Vol.70, No.1, pp. 65-69, 2004. J. Kaneko, Y. Yamauchi, and K. Horio, “Fast Estimation Method of Machinable Area of Workpiece Surface for 3+2 Axis Control Machining using Graphics Device,” J. of the Japan Society for Precision Engineering, Vol.79, No.2, pp. 182-186, 2013. W. Huang and M. Inui, “Algorithm for Determining the Optimal Cutter and Shank Length for Fixed 5-Axis Machining,” J. of the Japan Society for Precision Engineering, Vol.76, No.2, pp. 220-225, 2010. S.-H. Suh and J.-K. Kang, “Process planning for multi-axis NC machining of free surfaces,” Int. J. of Production Research, Vol.33, No.10, pp. 2723-2738, 1995. T. Kishinami, S. Kanai, H. Shinjo, H. Nakahara, and K. Saito, “An Application of Voxel Representation to Machining Simulator,” J. of the Japan Society for Precision Engineering, Vol.55, No.1, pp. 105-110, 1989. K. Nakamoto, T. Inaoka, K. Shirase, and T. Moriwaki, “Development of a Process Planning System for 5-axis Controlled Machine Tool (1st Report),” J. of the Japan Society for Precision Engineering, Vol.73, No.9, pp. 1019-1024, 2007. K. Nakamoto, M. Tsunoda, and K. Shirase, “Development of a Process Planning System for 5-axis Controlled Machine Tool (2nd Report),” J. of the Japan Society for Precision Engineering, Vol.76, No.3, pp. 317-321, 2010. C. Hirano and K. Morishige, “Development of Rough Cutting Method with Plunge Milling Using 5-axis Control Machine Tool,” J. of the Japan Society for Precision Engineering, Vol.73, No.11, pp. 1261-1266, 2007. T. Inoue, K. Nakamoto, T. Ihida, and Y. Takeuchi, “An Effective Machining Method for Roughing in 5-axis Control Machining,” Proc. of spring meeting of the Japan Society for Precision Engineering, pp. 1059-1060, 2009. T. Umehara, T. Ihida, K. Teramoto, and Y. Takeuchi, “Effective Tool Path Generation Method for Roughing in Multi-axis Control Machining,” J. of Japan Society of Mechanical Engineering, Vol.73, No.732, pp. 2387-2393, Aug. 2007. Y. Mizugaki, K. Kikkawa, K. Shichijyo, and K. Fukuda, “Determination of Intermittent Tool Orientation Series based on Genetic Algorithm for Simplified Multi-axes End Milling,” Proc. 6th Japan-France and 4th Asia-Europe Congress on Mechatronics, pp. 254-259, Sep. 9-11, 2003, Hatoyama, Japan. K. Kasahara, K. Murata, C. Suzuki, and A. Hirota, “Influence of Tool Tilting Angles on Cutting Forces and Tool Deflection in Ball End Milling (1st Report),” J. of the Japan Society for Precision Engineering, Vol.77, No.10, pp. 966-971, 2011. T. Fujita and H. Iwabe, “Study on evaluation for cutting performance of ball end milling with straight-line path method for inclined surface using 3D-CAD,” J. of the Japan Society of Mechanical Engineers, Vol.80, No.810, pp. 1-13, 2014. T. Kondo, T. Kishinami, and K. Saito, “Machining System based on Inverse Offset Method,” J. of the Japan Society for Precision Engineering, Vol.5, No.5, pp. 167-172, 1988. D. N. Reshtov and V. T. Portman: “Accuracy of Machine Tools,” ASME PRESS, 1988.